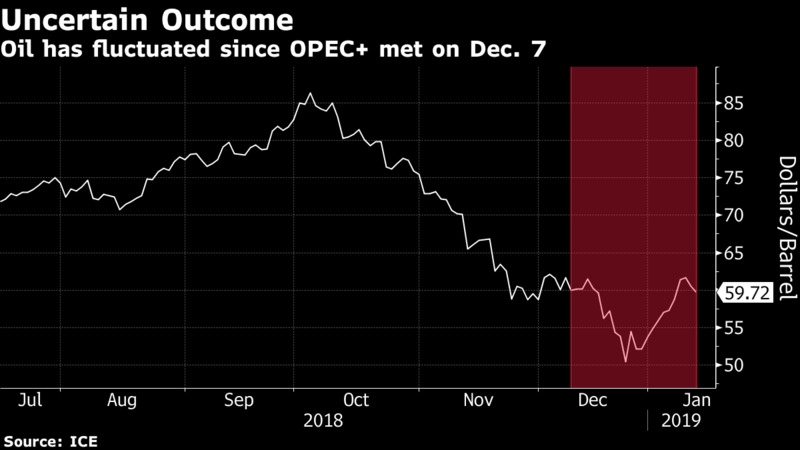 OPEC and its allies are still struggling to set the date for their next meeting, a sign that the coalition’s increased influence comes at a cost of slower decision-making. More than a month after the coalition last gathered, it still hasn’t specified a date for its next formal meeting -- tentatively scheduled for some point in April -- or a review to take place in the interim. It’s an unheard of delay for the cartel, which routinely concludes each conference with a speedy resolution on the date of the next. There’s more at stake than the travel schedules of government officials. Meetings of the Organization of Petroleum Exporting Countries and its partners -- who pump more than half the world’s crude -- are a focal point for multibillion dollar futures markets, which the trading desks of oil majors, refiners and hedge funds need to plan around. Through collective output cuts in 2017 and early last year, the coalition known as OPEC+ engineered a price recovery that ended the oil industry’s worst slump in a generation. The club of producers is now embarking on a new round of cutbacks as prices falter again amid surging U.S. oil supplies and signs of shaky fuel demand. Their latest initiative has so far failed to fully revive prices, which at just around $60 a barrel in London remain around 30 percent down from the a four-year high reached in October and below the levels that most OPEC nations require. Despite the growing need for clarity, the alliance’s two biggest producers, Saudi Arabia and Russia, are giving mixed signals on when it will next convene. OPEC+ initially planned to hold its interim review in Baku, Azerbaijan, in late February, and then the full ministerial assembly in April. However, Russian Energy Minister Alexander Novak said on Jan. 11 that the review would instead take place in April. Two days later, his Saudi counterpart Khalid Al-Falih said the review would be before April, but perhaps as only a conference call. The confusion seems to be a consequence of OPEC’s expansion into a broader fraternity with non-members. While partnering with outsiders such as Russia and Kazakhstan over the past two years has given the Middle East-dominated club greater power, it also brings logistical headaches. Whereas in the past, decision-making involved just the dozen-or-so OPEC members, these days consultations can span to all 24 nations in the extended network. There are also occasional differences between the coalition’s biggest two members, which could be seeping into the discussions on meeting dates. While Saudi Arabia and Russia have surprised analysts with their harmonious co-operation over the past two years, overcoming decades of commercial rivalry and mistrust, they still don’t always see eye-to-eye. Pumping more crude than most OPEC members, and boasting powerful diplomatic ties with many of them, Russia has become a decisive force in the organization. The Saudis have regularly been more willing to cut supplies deeper and for longer than their Russian counterparts. It’s been a source of contention that almost splintered the relationship in December, when Al-Falih complained Russia was unwilling to make a significant contribution. While the kingdom is cutting supply even more than it promised this month, Russia is sticking to a plan of gradual implementation. As a result, Russia’s cutback this month versus its October starting point will be barely a 10th of the 500,000 barrel-a-day reduction made by the Saudis. Al-Falih emphasized that Russia fulfilled its obligations under the previous agreement and he’s confident they’ll do so again. Any lingering differences are sure to be discussed at their next conference, whenever it is. Speaking again on Monday, Al-Falih confirmed that he would be attending a meeting of the OPEC+ coalition in the Azeri capital of Baku. He did not say when it would be.